A small but moving film, writer/director Hong Khaou's LILTING tells the story of two very different people finding a connection. Junn (Pei-pei Cheng) is an elderly Chinese woman who immigrated to England with her late husband years ago. Although she knows six languages, English isn't one of them, and she relies heavily on her son Kai (Andrew Leung) to take care of her. Junn is unaware that Kai's friend Richard (Ben Whishaw) is actually his lover. She only knows that he seems to take up more of her son's time and attention than she would like, and she further blames Richard for Kai's decision to temporarily place her in a nursing home. Richard is amenable to having Junn come live with him and Kai, but first Kai needs to work up the nerve to come out to his mother. Unfortunately, Kai dies suddenly and unexpectedly before that can happen. While dealing with his own grief, Richard also feels obligated to see what he can do to help Kai's mother, but that's easier said than done. A translator, Vann (Naomi Christie), helps with the language barrier, but the big unspoken truth between them complicates matters. As an aside, there's also a late in life romance between Junn and Alan (Peter Bowles), another resident at the nursing home. The language barrier doesn't stop these two from finding a connection. In fact when Vann starts translating for them at Richard's request, the greater clarity in communication actually sours the relationship. It's a subtle way of asking us to think about whether Richard should tell Junn the truth about his relationship with her late son, as well. 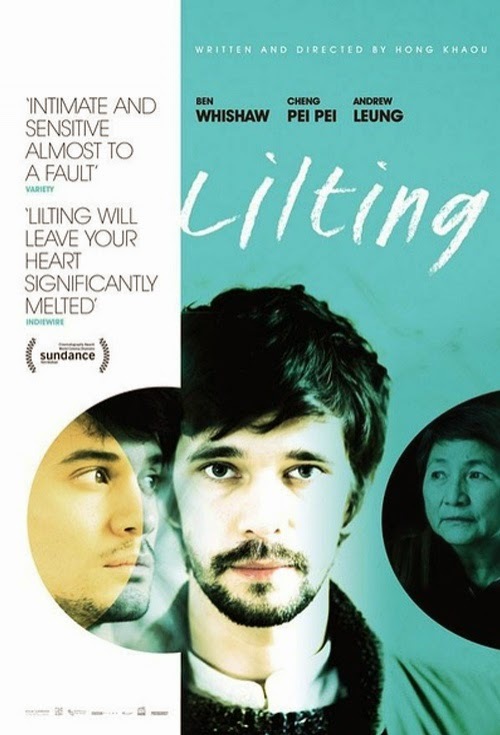 Just because Kai is dead at the beginning of the film doesn't mean LILTING is one of those asexual Hollywood gay films like PHILADELPHIA. Nor is it the full-on “gay cinema” kind of movies Charles is always whining about being stuck with. While not explicit, there are several flashback scenes of the two lovers in bed together, shirtless while cuddling and kissing. It seems kind of silly that something that would seem innocuous were it a heterosexual couple could still phase anyone in this day and age, but the truth is for many people scenes like this are a deal breaker. Too bad, because while LILTING certainly deals with gay themes and issues, it's primary message is universal: no matter how different we may seem, no matter what obstacles stand in the way, human beings can still connect with one another in meaningful ways. 4 out of 4 stars.